Multi-Award winner and nominee actress who is mainly known for portraying as Gloria Delgado-Pritchett in the television series, Modern Family is Sofia Vergara. Before that, she was a host of several Univision shows. Besides being an actress, she is also comedian, model, television host, and producer. The beautiful and talented actress was previously married to a handsome man, Joe Gonzalez. However, their relationship lasted for only 2 years and got divorced. Currently, Sofia is married to an American actor, Joe Manganiello. Sofia Margarita Vergara was born on July 10, 1972, in Barranquilla to Julio Enrique Vergara Robayo, father, and Margarita Vergara Davila de Vergara, mother. Likewise, she grew up along with her five siblings. In 1998, her older brother was murdered in a kidnapping attempt. Reviewing her nationality, Sofia is Columbian and she belongs to white ethnicity. 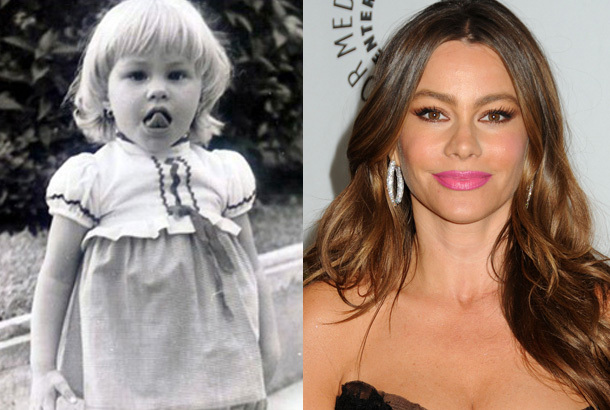 Columbian Actress, Sofia Vergara's childhood photos. Sofia studied dentistry for three years at the University of Columbia. However, later she quit her studies and began to develop her passion for modeling and show business. The multi-talented personality, Sofia came to limelight after a photographer offered her for modeling and television work. She made her first appearance at the age of 17, in a Pepsi Commercial. Afterward, following the field of interest, she then enrolled at the Creative Workshops Schools of Acting to hone an acting skill. Sofia made an on-screen appearance in the year of 1995 in the television series, Acapulco, Cuerpo y alma as Irasema. After seven years, she then made a film debut portraying a role of Nina in the movie Big Trouble. More recently, Sofia appeared in the movies named The Emoji Movie and The Brits Are Coming. The 45 years old Columbian actress, Vergara is currently married to her handsome boyfriend, Joe Manganiello. The couple tied a knot in the year of 2015. Husband Joe is an actor best known for his role in How I Met Your Mother with Jason Segel, Cobie Smulders, Neil Patrick Harris, and Alyson Hannigan. wife and husband, Sofia Vergara and Joe Manganiello. Prior to her current marriage, Sofia was married to Joe Gonzalez in 1991 while she was at the age of 19. The couple remained together for almost 2 years and got divorced. They have a son from their relationship named, Manolo Gonzalez-Ripoll Vergara. Former husband and wife, Joe Gonzalez and Sofie Vergara with their son. Currently, she is living a happy life with her husband, Joe Manganiello. Besides their relationship, she has not bruited in love affairs and neither there has been any serious conflict between them which would lead to their divorce. Vergara has accumulated a huge amount of money being a comedian, actress, producer, and television host. As of 2017, her net worth is estimated at around $100 million which has also made her highest paid actress of the current time.